Black Widows Empire Presents: Greatest Valentine’s Night Ever Variety Show! Love Valentine’s Day? Hate Valentine’s Day? Don’t care either way? Come out and party on February 14th! Enter a raffle, the night of, to win a date with ALL of us…at your own risk..
A Night of Surf-Roxotica with Exotica Go-Go at Icehouse, Mpls on November 20th! Click below for more info! Here is a fun still from the video we shot last week at NanoTako.com studio with friends from NanoTako and Flyover Films! We had a blast! Literally we were blasted with confetti! We will keep you updated on the video release! Did you know you can listen to us on Spotify? We are honored to be on this Spotify playlist with these leading ladies. 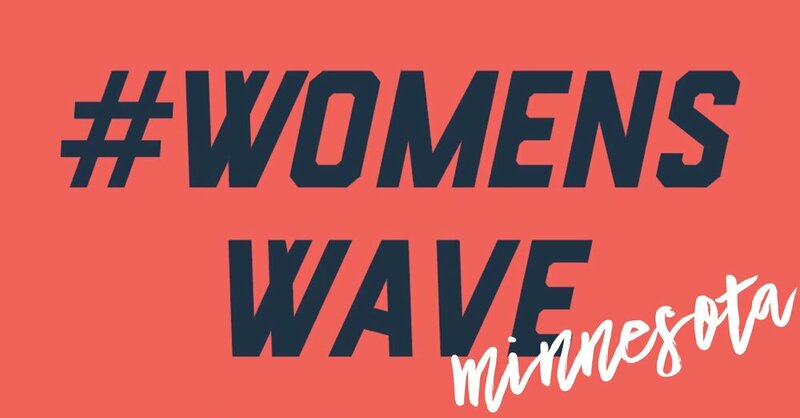 Happy Marching Minnesota! Resist and start your own revolution! Click on the poster below to listen! Come out and support our animal buddies while listening to some rock and roll music, laughing at and with comedian Legendary Bruce Leroy, and eat some vegan treats at Honey on Saturday, January 19th. This an event close to our hearts. Please consider donating to Soulspacefarmsanctuary.com if you can’t make the event. Kara Jean, the founder of the organization is doing great things! Click on poster for more info and ticket purchase! 331 Club with our buds from The Flasher and BSM one week from Friday! a few Shots by Jerry Pollard from our Summer Surf Rox-otica Party at BLB last night! 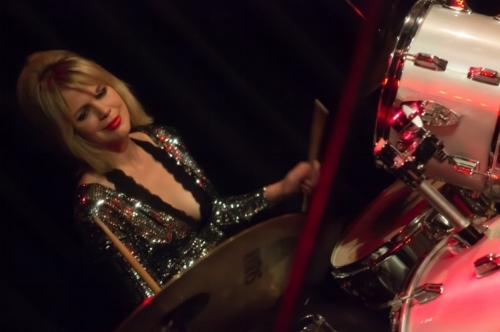 Get your tickets now for an intimate evening of mostly instrumental surf-rox-otica! Our next show! Headlining outside at 9pm! We are honored and excited to share the stage with Bombino Sunday, July 15th at the Cedar Cultural center! get tickets nOW. Click on link below. Watch us live from Hot Bed studio/ Savage aural Hotbed van! Happy Pride Minneapolis! We had an excellent time with the Black widows go-go dancers at The Saints game yesterday! Pride parade is Tomorrow! come see us float down hennepin avenue! TADAAAAAA! Thank you so much Simon Calder, Back to the City: MPLS music conversation, and Minnehaha Recording Company for the videos and interview! You are a super talented crew and make musicians feel like a million bucks! We tried to be focused and serious for this interview and Simon did a very good job of making it look like we did just that! 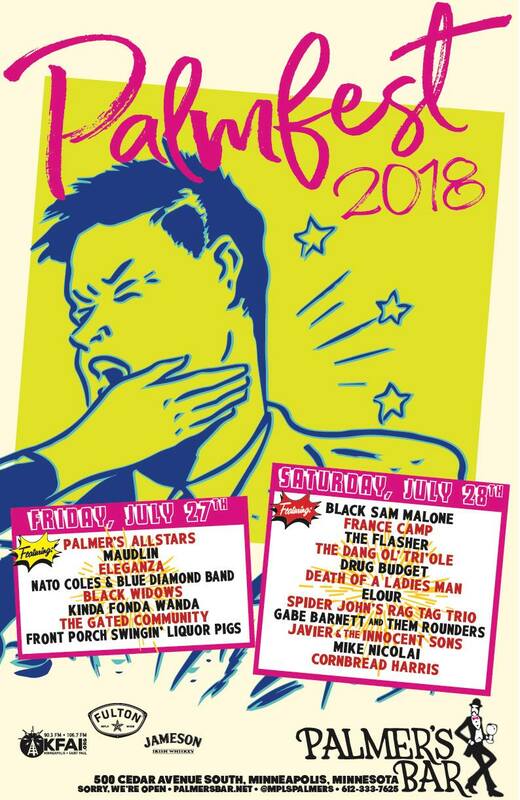 We can't wait to play the Bttc4: All The Pretty Horses, Black Widows, Gully Boys, DOALM coming up on June 28 with the amazing bands listed above and Black Widows Go-Go Dancers! 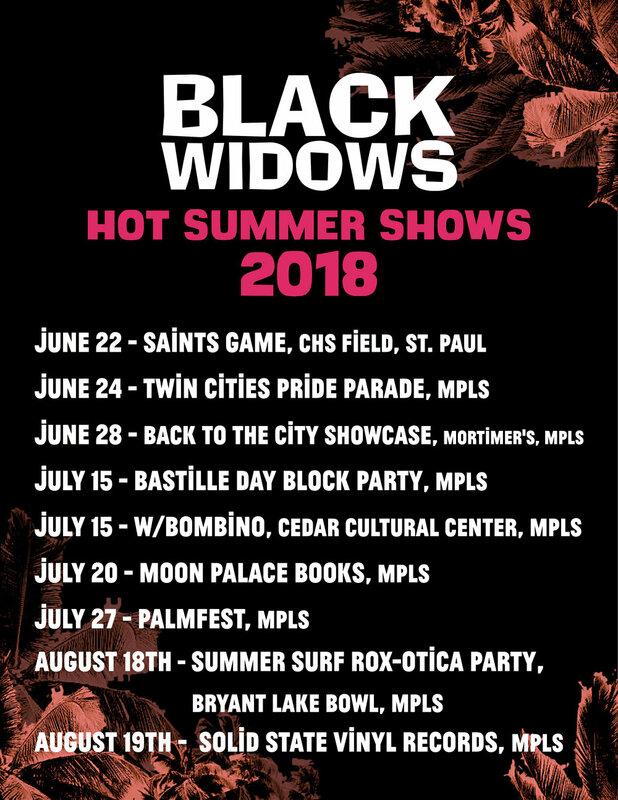 This week is Black Widows Week at Back to the City Minneapolis. Check out our live video featuring Black Widows Go-Go Dancers and stay tuned to our website for our interview with Simon Calder which comes out later this week! Fun Summer Shows outside and in! Free and cheap! over 21 and all ages! We live to entertain you! 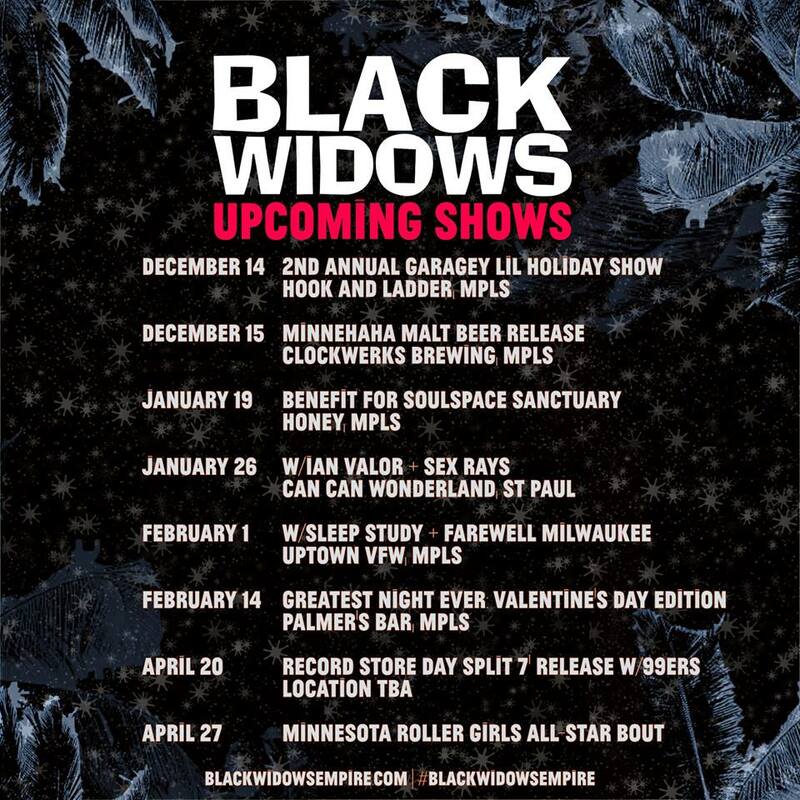 Black Widows will see you this Sunday for a hot and rowdy good time! Then at 5pm at 331 club..... Happy Art-a-whirl! Saturday, May 19. Free, All Ages! Remember that snowstorm back in April that ruined all your plans? Black Widows are pleased to be back at the Bryant Lake Bowl to make up for their "Sounds of Tortuga Island" release show that got buried in the snow! Get ready for Black Widows' "Summer Surf Rox-otica Party!" Black Widows will be gracing the theater with a set of high-energy (mostly) instrumental songs guaranteed to knock your flip-flops off. Fans of surf, exotica, and rock and roll - you're in for a treat. With the help of a few special guests, Black Widows promise a night jam-packed with original guitar-driven rockers with a few surprises mixed in. 1:30pm Saturday, May 19. Free, All Ages!